Navidad dog lead measures 115cm in length and features stunning, eye-catching pampa designs in red, gold, green and navy. This pampa pattern has been hand-stitched into the leather using the same artisanal skills that go into creating our iconic pampeano polo belts, which take up to five hours to hand-weave. The same leather is also used; premium, vegetable tanned A-grade Argentine leather that our craftsmen handpick from the local tanneries in Argentina. The leather is thick and strong, perfect for those dogs that like to pull, so you can have peace of mind on the safety and security of your dog. The chrome hardware and topstitching is also strong and tough, creating a product that has been made to last. The Navidad design has been a long standing favourite. The vibrant unisex colours of the threads look beautiful against the rich Havana brown leather and is sure to keep your dog looking extremely smart, no matter what their breed or colour. 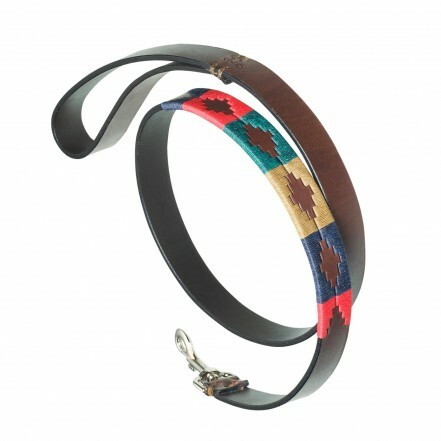 Pampeano&apos;s leather dog collars and leads are well known for their unique design and superb quality, having been featured in Crufts magazine as one of their top products and also spotted being donned in Vogue magazine, mixing practicality with high fashion. Due to popular demand, the Navidad design has been extended within our product ranges. Not only can you buy a matching Navidad leather dog collar and lead set for your dog, but you can also buy a matching Navidad leather polo belt for yourself. For the most stylish of dog walks, this is the ultimate co-ordinated collection for any dog lover. For an added touch of luxury, you can also have you dog lead and your polo belt personalised with blind embossed letters pressed into the leather.